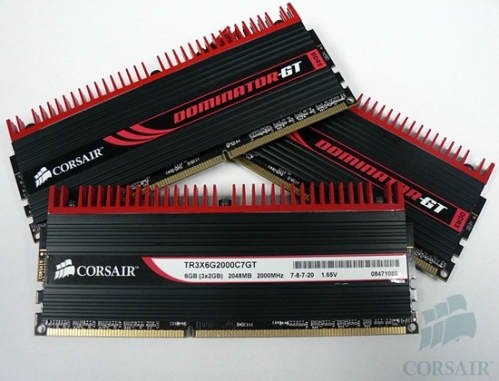 Corsair's newest Dominator GT 6GB (3x2GB) kit. Currently, as far as we know, it is the fastest 6GB, Intel Core i7 loving kit around. This mean kit works at 2000MHz with 7-8-7-20 latencies at 1.65Volts. The info is rather scarce at the moment, but you can find some benchmarks at the xtremesystems forum link located below. The new kit is cooled by cool red/black painted DHX heatsinks. According to our info, this kit won't hit retail before CES. We should know more once CES starts, but those that are keen on buying this one will have to wait a while. The price is still unknown, but according to some rumors and our unconfirmed info, it should sell at around US $650. it should sell at around US $650. All times are GMT +7. The time now is 09:14:45.